Epic's Cliff Bleszinski thinks that Sony missed a trick by not advertising cinematic thriller Heavy Rain to a female audience. Heavy Rain has sold about 1.5 million copies since its release earlier this year, and while that's pretty good going for brand new IP, Epic Games' design director Cliff Bleszinski thinks that Sony missed out on a big part of the game's potential audience by only going after core gamers. 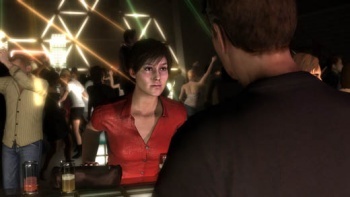 In an interview with Irrational Games' Ken Levine and Chris Remo, Bleszinski said that because true crime stories were so popular with women, Heavy Rain was the perfect game to get women who might not otherwise be interested in the hobby to give it a try. He thought that Sony would have seen significantly higher sales had it cast its marketing net a little wider and tried to catch the attention of a female audience. "I'm like, 'dude why isn't this in Entertainment Weekly?'" he said. "'Why aren't you marketing this to the right crowd?' There were scenes were I was almost literally dropping the controller it was paced so well. If you had that and shipped a disc with all those women's magazines you'd maybe have sold twice as much."